I felt like I was being excessively nice to my legs — taking rest days, avoiding running, and backing off efforts when I felt even a hint of lactic acid in my quads. Just two weeks had passed since the White Mountains 100, and already I felt restless, wistful for something more challenging, ready to breathe some fire. Taxes done and deadlines met, a window swung wide open on Wednesday. I excitedly planned a longer ride, just for fun, but with a gnawing desire to push myself at least a little. Then the wind came. I was sipping coffee at the dining room table when a gust ripped across the yard and slammed into the house with a loud knocking sound — as though something broke, but I'm not sure what. I was afraid to venture outside to check. A glance at measurements from our weather station revealed the wind speed: 50 mph. It wasn't even 9 a.m., and the wind was supposed to worsen throughout the day. Well. For the rest of the morning I glanced outside as trees bent sideways, and quivered along with them. I've ridden my bike through 50-plus-mile-per-hour gusts before, and I've been blown into a ditch. I've been hit with unidentified flying debris. I've also been pushed to the opposite side of the road without warning, which could have ended terribly if there had been any oncoming traffic. 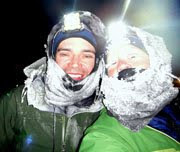 I'm frightened of strong wind — not because it creates difficulty, but because it's unpredictable with dangers that can't be lessened with any amount of gear or preparation, unlike heavy rain or 30 below zero. But on Wednesday, I had this gleam in my eye about the prospect. Sure, I didn't have to go outside and battle hurricane-force gusts for six hours. There was absolutely no good reason to subject myself to that. And yet. Now that more than a month has passed since I left the Iditarod Trail, much of my current stream-of-consciousness thought involves fond recollections about how happy I was out there. Isn't it weird how that works? During the race I struggled, so much, and managed to hold onto this pain long enough to convince myself not to sign up for next year. Then, as soon as the deadline passed, I felt regret. While continuing to process this strange wistfulness, I often think back to the day I broke my trekking pole in the Farewell Burn and dropped into the cold snow, curled into a fetal position and bawled about it ... for several minutes at least. I was just so fatigued and frustrated with the seeming futility of my efforts. The prospect of things becoming even slightly more difficult broke an emotional floodgate, and I was temporarily but utterly broken. Now that a month has passed, I think about that incident and smile — because it sure was a beautiful day, with the frosty dwarf spruce and glistening fresh snow blanketing the wind-blown swamps. All I want to do is go back. What is wrong with me? It will be easier to accept my limitations when I come down again. Right now I'm riding a bit of a high, feeling the strongest and most upbeat I've felt since December. Sure, I've got the sore legs, and the necessary Alaska recovery. But my emotional health has evened out and my breathing has been solid. Oxygen doesn't always come easily to me, and seems like a terrible thing to waste. That's how I found myself buffeted by amazingly strong headwinds as I dipped in and out of ruts on County Road 68J yesterday afternoon. A steady stream of dirt and small rocks pummeled my bare legs. Gusts stopped my wheels cold while I teetered precariously on embedded boulders. I'd crash through the invisible wall by mashing pedals as hard as I could, lungs searing as air rushed past my face faster than I could capture it. It was comical, really — like a mechanical rodeo on an unruly bicycle with a mind of its own. The sheer effort of mashing pedals flushed the soreness right out of my legs, and everything about the ridiculousness felt amazing. I was the unstoppable force against the immovable object. I was breathing that fire. If I'd ridden an hour and turned around, it would have been perfect. But I continued battling the lung-searing headwind all the way to Nederland, then endured what was mostly a crosswind along the busy Peak to Peak Highway. The gusts required hard leaning to the left, which I had to swiftly correct in relative lulls, otherwise I'd shoot out of the shoulder and into traffic. Finally I reached the Switzerland Trail and a long descent with the wind at my back. This proved to be a detriment to me while steering around the many sharp rocks littering the doubletrack. Eventually I just let the wind push me over the rocks, and ended up with a sharp kink in my lower back, because right now I'm not exactly well-conditioned for rough riding. The pain endured as I fought my way around the curve past Sugarloaf into the fiercest wind yet. Gusts were being sucked into the narrow funnel of Fourmile Canyon, and I was barely able to mash pedals for most of a rocky, four-mile descent. I was certain some the wind gusts were pushing 80 mph, but of course can't verify this. Later that evening, I searched Wunderground for nearby weather stations, and did find measured gusts of 70 mph. The final climb of the day was fairly protected from the wind, even when I pedaled in a westerly direction. I was finally able to relax as I bounced over sharp rocks for 1,500 feet of elevation gain. After nearly five hours of a ceaseless battle that demanded the depth of my strength, I felt drained — but in a pleasant way. Fatigue cleared my mind, making room for appreciative observations of the canyon's beauty to temporarily replace happy but preoccupying Alaska memories and unrealized ambitions. Glimpses of the Continental Divide revealed sharply contrasted black-and-white mountains framed by billowing clouds of blowing snow. Equally visible clouds of brown dust swept along the forested slopes to the south, but somehow left me alone, for a few minutes at least. Overhead the sky was a brilliant shade of blue, unexpectedly clear. Beauty is always easy to find, when I remember to look around. And there's beauty in the ridiculous, like riding a bike in 70-mph winds for no real reason. The happy memories of breathing fire and watching dramatic storm clouds outlast the fatigue, brightly eclipsing all of those pretty days of spring when I prudently rested my legs and did my taxes. Nice one Jill. Who said a rewarding life had to follow norms! Same weather here, huge clouds of gray Arizona dust migrating into Colorado, along with the attendant pollen. If I had to eliminate one month, it would be April. Sittin down in the Springs (CO Springs that is) STILL being battered by the ludicrous winds. AND it freaking SNOWED yesterday! In the MIDDLE of APRIL! (I'm not the snow and cold fanatic that you are Jill...I tend to fancy tropical weather). Had to work today but now that I'm off I still can't force myself out into the cold gale. Maybe (hopefully?) tomorrow. This is my last weekend here in CO (for this trip), and I'd really like to get in one more good ride in Cheyenne Canyon. We shall see. I can't even imagine going out on purpose last Weds like you did. I'm just not that tough, not even close. All I can say is WOW!!! You go girl!